When the People's Republic of China drew up its first constitution in 1954, it defined the country as a “unitary multinational state in which all the nationalities are equal.” The principal nationality is the Han people—those traditionally considered Chinese, who originated during the Han dynasty at the time of Christ. This dominant group numbers more than one billion people. The other 56 nationalities range in population from several hundred to 15 million. They live in China and are patriotic Chinese citizens, but they have their own unique language, history, and land. Politically, they are Chinese, but culturally they have another identity. In the decades leading up to 1949, conditions among these nationalities did not favor the Christian missionary effort. At that time minority peoples were despised, or were at best second-class citizens (they are no longer). Religious hierarchies oppressed them. Feudalism was rampant. Local conditions were chaotic because the central government lacked effective control. Many groups were ravaged by infighting as well as by struggles with other groups. Travel conditions were difficult and dangerous. Education was almost nonexistent, and there was no written literature. The planting and use of opium was the foundation of local economies. Banditry and murder were everyday occurrences. Deadly diseases killed off missionaries, as well as the local people. Apart from times of special crisis, missionaries and local Christians usually were free to preach the gospel. But they faced enormous social, political, and religious challenges. With the exception of the Mongols, all nationalities in northern China are Muslim. The Mongols and Tibetans believe in Lamaism, a form of Buddhism. Nearly every group in southwest China believes in spirits, or animism—a traditional religion. As missionaries began to reach out to the minorities, the Muslims and Buddhists resisted vigorously. These groups were very structured, with holy books, a priesthood, places of worship, and religious communities. Animistic groups, on the other hand, often received the gospel enthusiastically and saw their lives and communities dramatically changed. This can be seen clearly in the cases of the Lisu and Miao peoples. The Lisu live mostly in western Yunnan province near the northern border with Sichuan, and also in a few counties in Sichuan. The first Protestant foreign missionary to concentrate his ministry on them was James Fraser of the China Inland Mission, who began his work in Yunnan in 1910. Initially the gospel message bore little fruit. After a short time, Fraser realized that he was in a spiritual battle against demon worship, ancestral rites, the use of opium, and addiction to whiskey. He devoted himself to long periods of prayer. During one of these times of prayer, Fraser came to the conviction that the Lisu and other minority groups like them came best to Christ by families, or even by many families, in what came to be called mass movements. He increasingly focused on the bridge from individuals to families. His change of approach gradually resulted in hundreds of families turning to Christ from many villages. By 1918, 60,000 Lisu believers had been baptized. Fraser was not alone in his convictions, and the same results were seen by other mission societies such as the English Methodists, American Baptists, and Assemblies of God. During a waiting period of two years, new Lisu converts were taught Christian beliefs and helped to give up opium, whiskey, and demon worship. Then they were baptized and led into programs of ongoing discipleship. One of these was the Rainy Season Bible School, in which people took advantage of slack times in their farming seasons to study the Bible. Fraser did everything he could to help the people in practical ways, such as bringing medical supplies with him as he visited their villages. But he was firm in his belief that the emerging churches should not become dependent on foreign aid. Lisu church leaders now credit Fraser for keeping them from depending too much on outside help. Today, there are nearly 300,000 Lisu Christians. The Religious Affairs Bureau has suggested that Christianity be considered the official religion of that minority group. The Amity Foundation recently reprinted the Lisu New Testament—using the script and translation that James Fraser developed. Different groups of the Miao people, with different languages and cultures, are scattered across the Sichuan, Guizhou, Yunnan, and Hunan provinces. J. R. Adam, a CIM missionary belonging to the Free Church of Scotland, was the key figure in the early development of Protestant work among this nationality. In 1899 and in the early 1900s, he traveled to hundreds of villages and baptized 7,000 Miao, largely in the province of Guizhou. The various Miao peoples were badly oppressed by the Chinese and other minority groups. Therefore they were deeply attracted to the Christian message of Jesus' suffering on the cross—how could they refuse him who had suffered so much for them as a suffering people? “You do not really mean that God loves us Miao, do you?” asked one after hearing the preaching of English Methodist missionary Samuel Pollard, who began working among them during the first few years of the 20th century. Pollard fought against the oppression of the Miao, clashing with Chinese officials when they dealt unjustly over matters of land ownership. He was concerned about the poverty of the Miao and helped them to buy their own land and to save money which could then be invested in a type of credit union. For this he was nearly beaten to death at the orders of a greedy landlord. Pollard taught Miao Christians how to pray for God's protection from evil spirits. Under his leadership, new Christians saw Jesus as the great liberator from this evil demonic world. This, along with his clashes with landlords, gave Pollard a standing among them that was unique for a white foreigner. He also forbade infant betrothals, set the marrying age of men at 20 and of women at 18, and forbade bridegrooms to give dowries (buy wives) at weddings. Later Miao Christian leaders came to see these “laws” as great helps to spreading the Christian faith. After the Communist takeover, and especially during the Cultural Revolution, Miao Christians endured intense persecution. But Communist officials' attempt to stamp out Christianity among the Miao had the opposite effect: Independent evangelists arose, house churches multiplied, and more and more people turned to Christ. When Westminster Abbey commemorated 10 Christian martyrs of the 20th century in 1998, a Miao leader, Wang Zhiming, represented those who had died in China. The well-loved pastor had been executed in front of a crowd of over 10,000 people in 1973. Today, there are nearly a million Miao Christians. How are the Miao facing modern Chinese society? In some senses, they are becoming more Chinese—learning Mandarin, wearing Chinese clothes, and using electricity, radios, television sets, and tape recorders in their homes. They continue to hold fast to their faith. 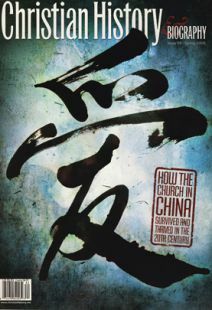 In some areas of China, Communist officials continue to create conditions in which it is hard for the church to grow, but many have begun to see that trusting Christ helps people live better lives and there is no reason to oppose Christianity. Ralph Covell is senior professor of world Christianity at Denver Seminary and a former missionary for 20 years in China and Taiwan.